The Internet of Things is changing business. While most of the time we talk about the impact on manufacturing, logistics, and operations, what we need to realize is that IoT will have a major effect on sales and marketing processes, too. In a transparent, real-time, interconnected world, everything about business will be transformed as information flows freely to the buyer, giving them more data points that shape when and how they make a buying decision. Here are just 3 of the ways that IoT will change the buying process. And this is only the beginning. Using IoT in retail is one of the most talked about uses. IoT technologies like RFID and Bluetooth Low Energy beacons are being used in malls, airports, and hospitals to provide information for better way-finding, or to let the visitor know about special offers. Beacon-and-mobile app driven applications are the most logical and simple for marketing and sales to adapt to, as they are essentially extensions of mobile and social applications that have been gaining traction for the past several years. Sellers have had to become comfortable with the fact that a buyer can get competitive information at the push of a button whether to buy jeans, a refrigerator, or a car. When you think about the fact that car buying has already seen a major transformation, it’s easy to start thinking about what other industries will be impacted by the instant availability of location, quality, reliability, and price. In the old way of selling, the sales rep developed a relationship with their buyer and became a favorite vendor, confident of follow-on business as long as they kept that relationship alive with the occasional visit, lunch or golf game. Systems such as healthcare have long relied on their trusted vendors and physician preference to make critical buying decisions. To make better buying decisions, healthcare decision-makers need information focused specifically on their areas of control: how efficiently they use operating room time, how variations in surgical practice impact both outcomes and cost, and how their preferred equipment performs against the alternatives. Hospitals are starting to look at IoT as a way to better understand their supply chain, reduce excess inventory, and improve maintenance and cleaning processes to ensure availability of critical equipment. IoT will give hospitals the data they to make more timely, less biased, and more informed buying decisions by knowing exactly what they need, when, and how it contributes to operating costs. This will create a disruptive situation where the buyer will definitely be better informed than the sales rep.
Have you heard of the Amazon Dash™ Button? It’s a very simple IoT tool. Just push the button when your dish soap is empty and more is on its way. No going to the store, no monthly reorders. Order anytime you need some with just a click. With connected machines and IoT sensors that will automatically send alerts when they are empty or need repaired, whole industries are transforming. This started with the vending machines – connected soda machines have been around a while now – able to alert the warehouse when it’s time for a refill. When you get to bigger industrial applications, IoT disrupts even the idea of the monthly subscription for “managed services” when everything becomes “connected” and bypasses sales all together. IoT will take managed services to the edge of the network, gathering input from areas that have never been connected before. In this scenario, sales could be left out altogether, taking it straight from marketing to customer service. This type of connected and automated renewal model would be very hard to break into competitively once a customer settles into their auto-refill mode. 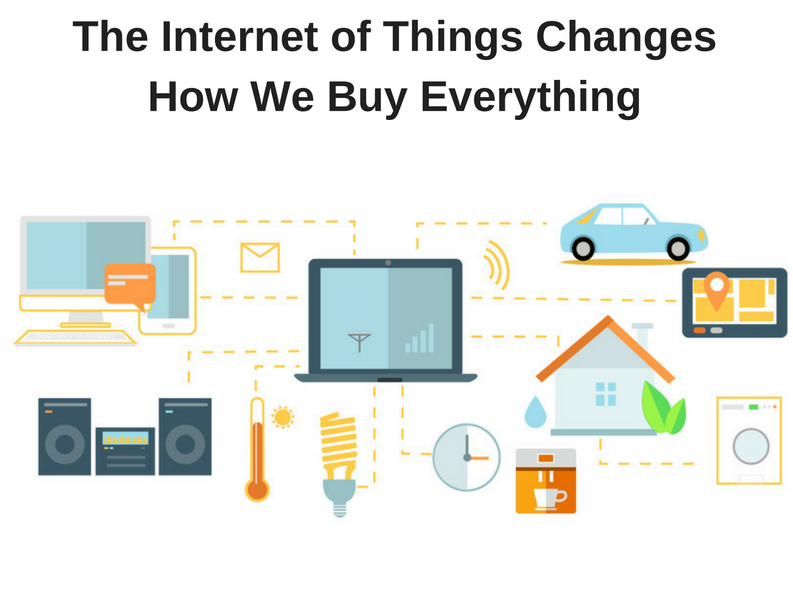 I’ve only named 3 ways, but are many other ways IoT is changing the buying process, which means we need to start thinking about this today. Will our current sales and marketing processes keep up with how our business is evolving and connecting to the buyer? How will we evolve to sell to a vastly better informed buyer? Let’s make sure that sales is keeping up with the IoT revolution. Kathleen Glass is the CEO of Oinkodomeo, an agency that connects sales and marketing. Kathleen brings her experience in IoT, cybersecurity, telecom, and analytics to help B2B enterprise understand and adapt to today’s buyer.